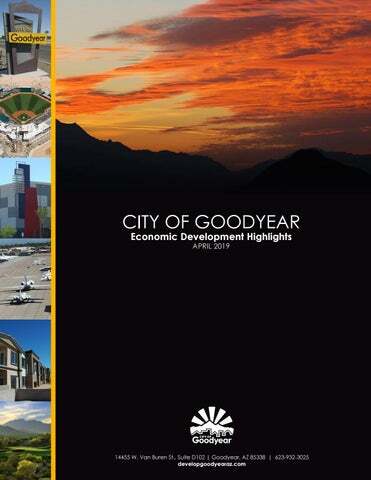 Incentives* Plan Review and Permit Fees Reduction or waive fees Construction Sales Tax Reimbursements Up to 50% of City portion on public infrastructure Improvements Streamlined Procedures Goodyear makes it simple and easy with faster turnaround times and a customer friendly experience Enhanced permitting and development process Apply for building permits with our “Permit by Email” program Sit down with our building inspectors with our “Over the Counter Plan Review” program Minimal regulations and reduced operating costs compared to other states Military Reuse Zones Property Tax Reclassification New Job Income and Premium Tax Credits Transaction Privilege Tax Exemptions Foreign Trade Zones Reduction in Import Duties and Processing Fees Reduction in Real and Personal Equipment Property Taxes Increased Security Government Property Lease Excise Tax (GPLET) Eight Year Tax Abatement * Requires third party economic analysis and City Council approval. Dignity Health Arizona General ER is a freestanding fully-equipped, 24-hour emergency room. Location:	SEC Van Buren St. & Estrella Pkwy. Location:	North of I-10 between Bullard Ave. & Dysart Rd. Convenient primary care, on-site labs and x-rays. Location:	North of NEC Elliot Rd. & Estrella Pkwy. NextCare Urgent Care Estrella 7-day a week healthcare for walk-in patients. Location:	West of NWC Elliot Rd. & Estrella Pkwy. Location: South of SWC Van Buren St. & Litchfield Rd. Adelante Goodyear Health Center 45,000 SF site offering family and internal medicine, pediatrics, womenâ&#x20AC;&#x2122;s health and dental. Location:	South of McDowell Rd. on Cornerstone Blvd. Grades 6-12 - Non-profit, public charter school providing classical preparatory education. Grades K-10 - Non-profit, public charter school. Only location in the southwest valley. Location:	North of NEC McDowell Rd. & Bullard Ave. Location: NWC of Sherman St. & Goodyear Blvd. Valor Preparatory Academy 10,000 SF will house the Primavera Preparatory Academy and iCode Coding School Location:	SWC Dysart Rd. & Thomas Rd. Avilla Homes Estrella Pkwy. & Van Buren St. AV Homes 968 N. 169th Ave.
Beazer Homes 16328 W. Lincoln St. 17563 W. Summit Dr.
David Weekly Homes 18285 W. Sequoia Dr. 18254 W. Desert Sage Dr.
Fulton Homes 1-10 & Estrella Pkwy. 18258 W. Montecito Ave. 18060 W. Turney Ave. 4315 N. 183rd Dr. 4152 N. 182nd Ln. Litchfield Rd. & Palm Valley Blvd. Pebble Creek - Robson 3003 N. 164th Ave. Pulte Homes 700 S. 178th Ln. Richmond American Homes 229 N. 167th Dr. 372 N. 159th Ave.	556 N. 157th Dr. Shea Homes 12105 S. 185th Dr. Taylor Morrison 3033 S. 185th Dr. William Ryan Homes 12175 S. 184th Ave.